Jeseníky is the second highest mountain range in Czechia. 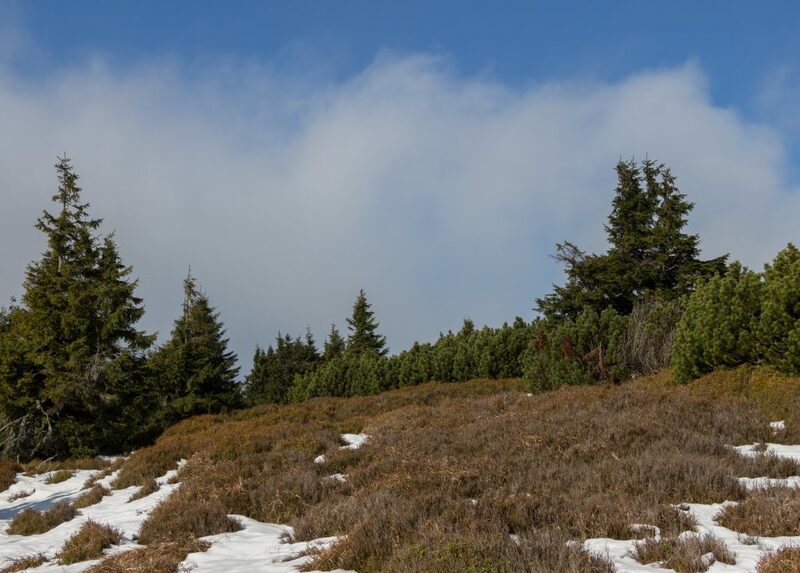 It lies close to the border with Poland, in the north-eastern part of the country and the crossing of the main ridge is a classic Czech hike. Jeseniky is still considered to be quite wild which is quite rare for a densely inhabited country. It used to be full of wolves and lynxes but nowadays seeing such a predator would be as rare as seeing a vegan in the army or my girlfriend Anna doing the dishes. There are many ways to cross the range but probably the most classic one follows the red marked route from Ramzová to Rýmařov. You can walk it from either direction, I’ll tell you how it is from the west side – Ramzová. Ramzová is a typical ski village and beside a few ski fields, a small train station and a few houses there’s nothing much to see. The red marked route is easily visible and goes along a ski field all the way up to Šerák (1351 m). There is a crossroad just below the top where you go right towards Keprník (1423 m). On a good day you can see sooo far! From Keprník the trail goes down and up a few times and eventually leads to another ski village Červenohorské sedlo where you can find a few pubs. Cross the main road and follow the red marks into the forest again. The next few kilometres are very lovely. 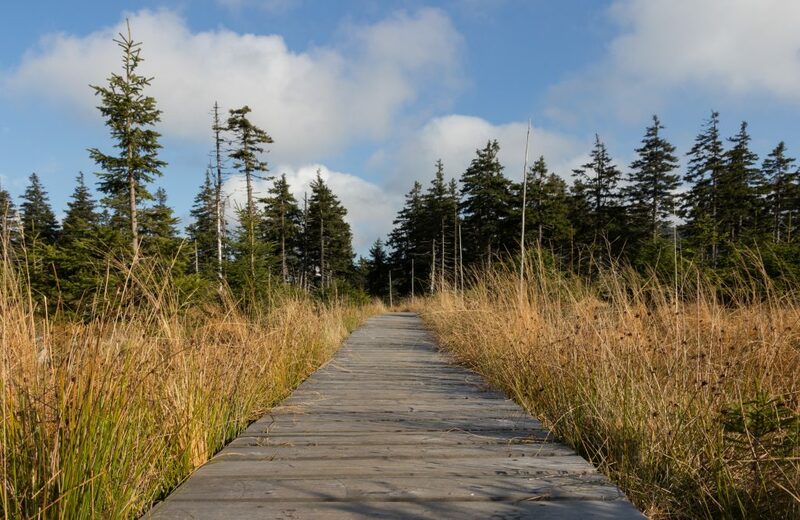 The trail often becomes a boardwalk which helps you to jump over the boggy parts and keep your feet dry. After passing Malý Jezerník (1208 m), it’s not too far to Švýcárna, an old wooden mountain hut with a pub inside. That’s very typical for Czech mountain huts – they always contain a pub. 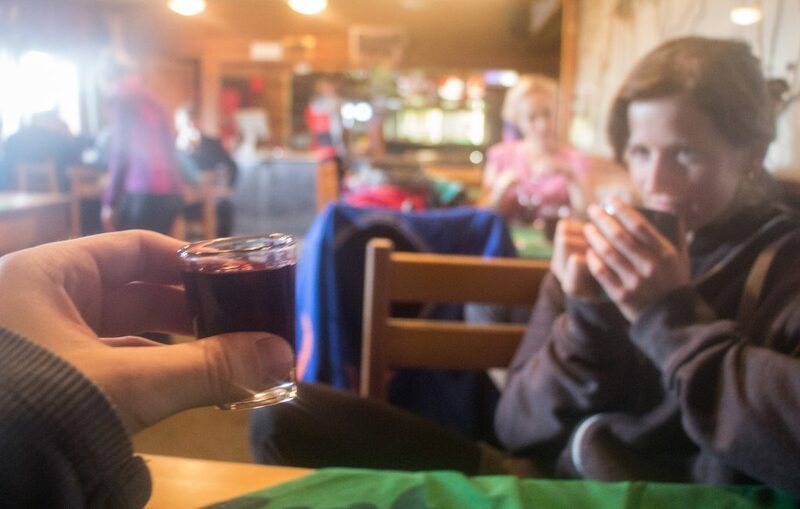 I strongly recommend you stop there and try “borůvkový sen” (literally blueberry dream) which is a local speciality – a mixture of rum, a bunch of species and blueberries. An unforgettable experience. By following the red marked route a bit further you come to a crossroad under Praděd mountain (1492 m). It is worth doing about a half hour side trip up to the the top. You can find a TV tower there with a watchtower on the top (you have to pay to get a lift up) and – surprisingly – a pub at the bottom. From Praděd, the main crossing trail continues towards Ovčárna. In general, the part from Švýcárna and Ovčárna is very busy because there is a bus stop and huge carpark in Ovčárna and locals often drive up here to get some fresh air and walk their dogs and kids. At the same time this part is full of huts where you can sleep. 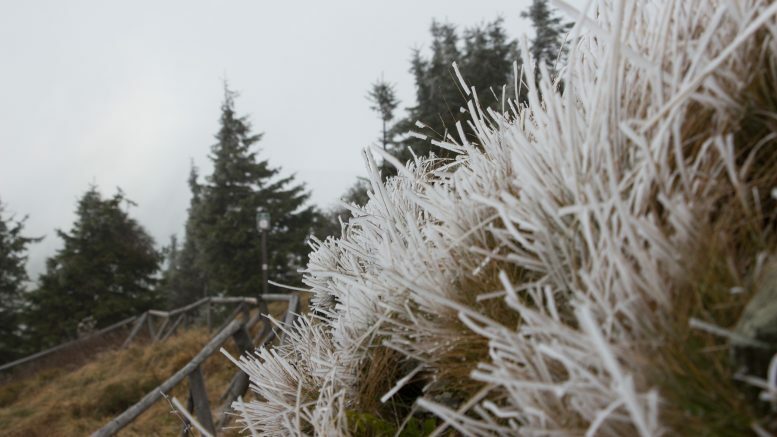 The prices vary and I had a good experience at Švýcárna which is the only hut with mountainous atmosphere. This time we slept in Barborka though which wasn’t bad at all either. Once in Ovčárna, you keep on following the red marks towards the ridge. This part is above the tree line and it’s supposed to be very beautiful, but we couldn’t see a thing through a milky fog. 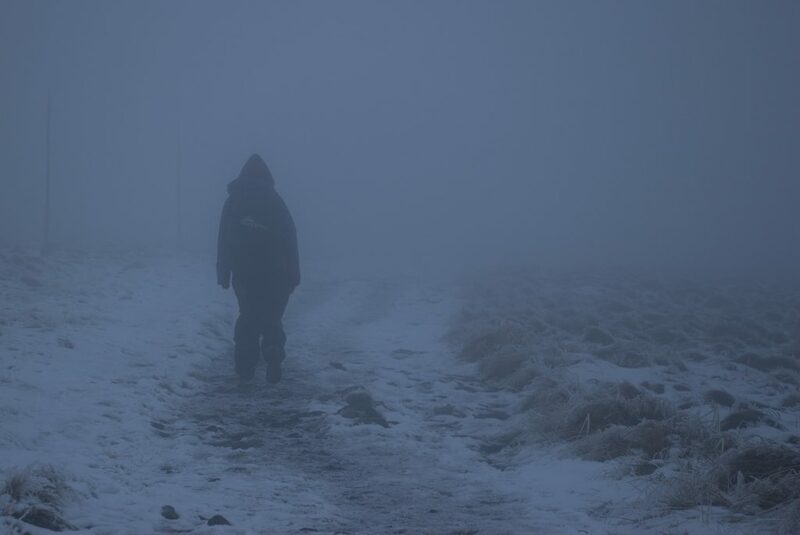 Even in this kind of weather the navigation was clear and you don’t have to be afraid of getting lost. After the open section the trail leads you through a very dense primeval forest towards the mountain hut Alfrédka. Beside Alfrédka you join the road which takes you all the way down to Stará Ves, Janovice and Rýmařov. If you are lucky enough, you can catch the bus from Janovice, otherwise you have to walk or hitch to Rýmařov which has a good bus connection. It’s a really great hike and even if it’s considered to be “wild”, you barely come to a place where you wouldn’t see roads or villages on the foothills. 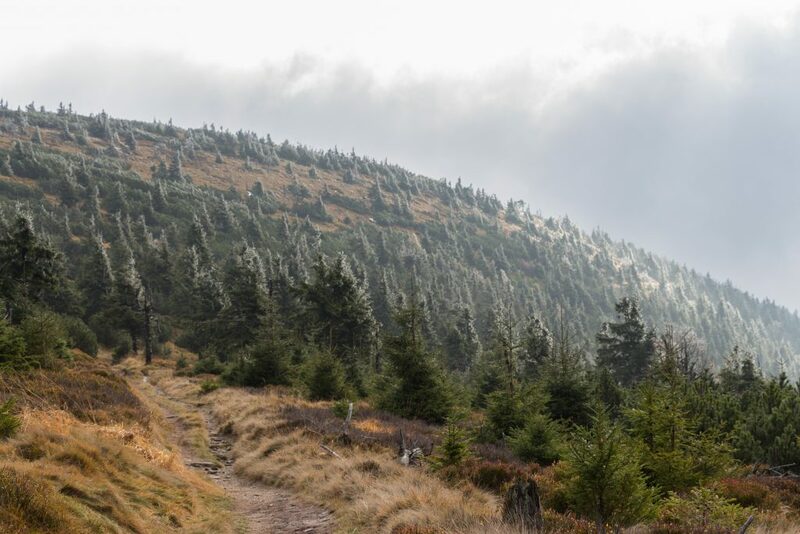 The number of pubs on the way also chase away the feeling of wilderness, but considering the Czech Republic is so densely inhabited, it’s still one of the best overnight mountain hikes in the country that you can do. Be the first to comment on "Autumn crossing of the main ridge of Jeseníky"